Myths, Urban legends and literature. What does the word 'Hallowe'en' mean? Whv do people dress up as witches and ghosts? What is 'Trick or treat'? Whv are pumpkins made into lanterns? The night of the 31st of October. All Hallows' Eve. The evening before All Hallows' Day or All Saints Day (1st November). 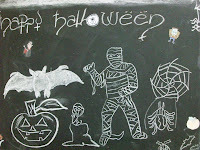 Hallowe'en was originally a pagan festival of the dead. Celts in Ireland had a festival called 'Samhain' (pronounced 'sow-in'), which marked the official end of summer and the beginning of the Celtic New Year. On this night the souls of the dead were said to come out and move freely in the land of the living. The tradition of Hallowe'en was taken to the United States by Irish emigrants, and it is now spreading in Britain and other European countries. In addition to the souls of the dead, the Devil, witches and numerous spirits are believed to be out, and at the peak of their supernatural powers. According to an old Irish peasant practice, villagers would go from house to house to ask for soul cakes (bread with currants) in return for promises of prosperity or protection against bad luck. Now children and teenagers go from house to house asking for small gifts of money, fruit or sweets in return for not playing tricks on the people inside. According to Irish legend, when a notorious drunkard called Jack died, he was refused entry to Heaven because of his meanness, and he was banned from Hell because he had tricked the Devil on several occasions. However, the Devil gave him a piece of coal to help him find his way in the dark of purgatory, which Jack put into a turnip to make a lantern. The Irish made similar lanterns to represent the souls of the dead on Hallowe'en, but when they emigrated to America they could not find many turnips so they used pumpkins instead. King Zygmunt August met his future wife at the Royal Castle in Warsaw. At that time Barbara lived in the palace of the Radziwill and the lovers met secretly in her palace through the secret passage, which connect the Castle with her house. After secret wedding in Wilno and the ceremony of Barbara’s coronation they returned to Warsaw again . They lived in a newly built wing of the castle overlooking the Vistula river. Their marriage did not last long because Barbara suddenly got ill on a mysterious disease and died. King Zygmunt August had been sad for a long time after the death of his beloved wife Barbara Radziwiłłówna. When he fell in depression to remedy this, his aides hired German magician Tureus to raise his wife. One night in 1569 Tureus closed with the king in the queen’s chamber . Tureus told him to sit on a chair facing back-to-door and set before the king a mirror. Queen appeared in the yellow dress after a special rite behind the king’s back but he could see her in the mirror. The legend says that her spirit was seen several times on the old town in Warsaw, it always wore the yellow dress and held the the mirror at the height of her face. Urban Legend: A person makes a bet with their friends that they can spend the night in a cemetery and she is found dead in the morning in the arms of a graveyard statue. What It's About: A person makes a bet with a group of friends that he or she (more often it's a she) can spend the night in the cemetery. The person is found dead in the morning, laying across the arms of a large statue, usually of an angel with it's arms out-stretched. This legend also included a statue of an old woman seated with her arms out stretched. Variations on this are: as an initiation into a gang, a fraternity or sorority or into a high school clique. The dead person is found dead with no sign of injury or has also been found to be sitting on the lap of the seated statue with crushed ribs, presumably by the arms of the statue. But the end result is always the same, the person is dead in the arms of the statue. Origins: This legend has been told as having happened in various parts of the United States but no true origins can be found. 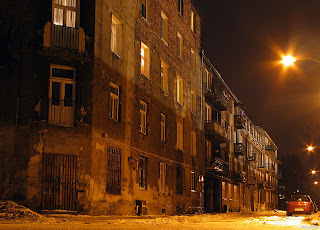 In 2003 the citizens of The North Praga, old district of Warsaw were terrified by the rumour going arround about a secretive violator. He had many faces, sometimes wore black long coat, some other time he was seen in a short green jacket, but all the witneses were sure about one thing: he was a very tall and strong-built man. The women were afraid to return home from work in the evening. Their husbands, boy-friends or parents waited for them and took them back from offices, schools, shops or the church. The violator usually had been atacking after dusk or in the evening. He used to strike his victims with a knuckle-duster and he waited until they awoke from the faint. Next he violated them and cut their fases with a blade. He forever remained an elusive bad man from the North Praga. The police never captured him. Warsaw, 1946. The intersection of Bracka Street with Sikorskiego Avenue. Pictured: Lodzia (Leokadia Kubanowska), a policewoman from the Road Traffic Company. 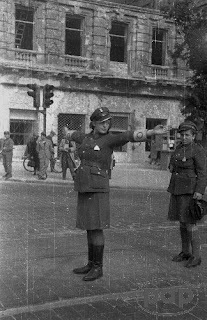 She had been regulating the traffic on the same intersection for ten years although there was no traffic at all. Only police cars drove in th streets. In the 80's she appeared again in the center of Warsaw on the intersection of Marszalkowska and Jerozolimskie Avenue - old, mentally ill woman, and was all drivers' nuisance. One day she died in a car accident killed by a drunken driver who drove away from the place of the accident . From that time she was seen on the same intersection and made collisions in which died drunken drivers. The employee with the wheelbarrow. - "I’ve seen you walk out of here every night, and I know you’ve been stealing something. But I can’t for the life of me see what it is!" - "Wheelbarrows" said the employee. A man who worked in a large factory was stopped on his way out every night as he wheeled out a wheelbarrow full of straw. Each night the suspicious security guard would sift through the straw to make sure the employee wasn’t stealing, each night he found nothing but straw. Years later the man was retiring and as he left the guard said that he knew he was stealing something all these years, what was it. The black volga car was spotted frequently in the streets of Warsaw in the 60's packed with kidnappers who were snatching children.The origin of this legend propably came from Kremlin. The high rank soviet officials drove the black volga in Moscow in the 30's and kidnapped young, pretty girls for the sexual pleasure. After years the victims who had survived described their experience. The other version of this legend tells that vampires or bodies venders drove the black volga car. Milagros Esteves was a fine girl, but not too bright. One day she got asked a date by one guy she really liked, so on the day of the date she wanted to look pretty. The day came but she never showed up and as days went by her boy decided to pay her a visit in order to know what happened. Telephone calls didn't work so he went to her home and after waiting for an answer he decided to take a look inside from the back part of the house which had a window to the kitchen only to find out his date laying on the kitchen's floor. When police arrived they could reconstruct the girls last moments. As time for the meeting came closer Milagros noticed her hair was still too wet to be combed so an idea struck her mind. She would go to the kitchen, get a knife, head for the microwave oven, open its door, falsely lock the door in order to keep it open and dry her hair by placing her head inside the oven. Doctors diagnosed death by boiled brain. A bricklayer working on a three-story-tall chimney had set up a pulley system so that his helper could raise the bricks up to where he needed them. As he was working, his helper complained about how difficult it would be to get the last of the bricks up to the flat roof of the building. Just then another contractor had some material delivered and it was placed on the roof by a fork lift brought to unload it. The bricklayer asked if the driver would load the rest of the bricks up there as well and the driver agreed. The bricklayer realized that he would not need his helper any more and sent him home. When the bricklayer completed the chimney he noticed that he had quite a few bricks left over and that the fork lift was no longer at the jobsite. Now he had to figure out how to get the leftover bricks back down by himself. If he dropped them, they would surely break. So he decided to use the pulley he had set up earlier to lower them down. First he went down to the ground and raised a large metal bucket up to the roof level using the rope and pulley. Next, he tied the rope off onto a railing and climbed back up to the roof and loaded the bricks into the bucket. Then he went back down to the ground. He knew that the bricks would be heavy, so he wrapped the rope around his hand a couple of times and then untied the end of the rope with his other hand. Well, the bricks were heavier than he imagined and with physics being as it is, he was immediately launched upwards at a high rate of speed. As he was racing up towards the roof he encountered the bucket full of bricks coming down at an equally fast rate. He collided with the bucket and broke his nose and his shoulder. The bucket passed him by as he sped upwards. He reached the pulley just before the bucket hit the ground and broke a few of his fingers as they were pulled into the pulley. When the bucket hit the ground, its bottom fell out and all of the bricks spilled onto the ground. Now the fun reversed. As the now light bucket sped upwards, the mason took a shot to the groin when one of his legs slipped into the empty bucket. He then tilted enough to fall out of the bucket and continued with his gravity experiment. Eventually he landed on top of the pile of bricks and broke both feet. He collapsed in pain there on the bricks, but was glad to be alive. He let go off the rope and cried out for help. It was then that the bucket hit him in the head and fractured his skull.